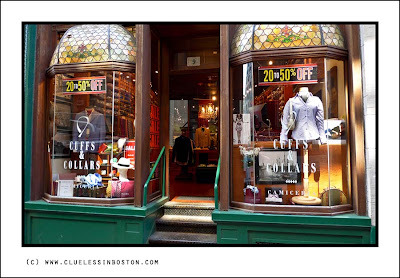 This week's doorway belongs to Cuffs and Collars, an Italian shirt store on Water Street. What a great traditional looking shop front; love the name of the store. Makes a great shot. I like those old fashion bow-windows. It gives charm to the shop. Spectacular store front. Love the stained-glass work. You really take us up the steps and into the store with this shot. Nicely done. Crisp shot of a cool shop. It shows off some of Boston's charm. I like the door, but the windows steal the show! Such an elegant façade store! Beautiful door and your picture is fabulous! Pretty. I like the colors. I like the the stained glass windows - stylish and a bit old fashioned.